Remember those small, lovely bottles you’ve seen in the dessert wine section of your favorite tasting room or wine store? Many wine-lovers have yet to discover how delicious a late harvest wine can taste – especially when paired with cheese and honey, chocolate or a fruit-based dessert. The perfect sweet dessert wine for Valentine’s Day, late harvest wine is simple to understand and easy to find here in Temecula Valley! 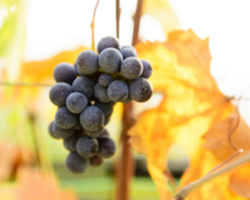 “Late harvest” refers to wines made from grapes left on the vine longer than usual and picked later than normal. Late harvest grapes are often more similar to raisins, but have been naturally dehydrated while still on the vine. Late harvest wines are made around the world with almost every grape imaginable. Grapes like zinfandel and riesling are ideally suited to produce late harvest wine and are among the most popular. Grapes used for late harvest wines go through their full growth cycle and then some – becoming super sweet and losing acidity as they ripen. “Noble rot” is the term for the edible mold that causes grapes to lose nearly all of their water content. This natural process begins to take place in late September and can last until late October. Late harvest grapes are often hand-picked. Sometimes, the usable grapes from one vine may only produce enough juice for a single glass. Mother’s Day in Temecula Wine Country! Mother’s Day Brunch / May 14 / Two seating’s: 9:30 to 11:30 and 12:30 to 2:30 / Set up on top of Bel Vino’s Hilltop Terrace, we will be hosting a bottomless mimosa brunch, to include an Egg Bar, Bagel Bar, Carving Station. Spring Salad, Chicken and Waffles, Assorted Desserts, Crab Cakes, Yogurt Parfaits, Fruit Varieties, Live Music and more! Wine and Beer Extra. Children 3 and under are free / $83.99 for non-members, $71.06 for Wine Club Members, $29.67 for children / Call 951-676-6414 to make reservation. Mother’s Day Special Treat / May 14 / 11am-6pm / Join us for a Special Treat…Bubbly Peach Sangria Flute Floats! / $8 each; Logo flute INCLUDED. $4 each for Wine Club Members! The first 25 guests to pre-pay will also receive a long stem rose for Mom! Come by…call 951.767.8398…or email events@cougarvineyards.com to pre-pay. Mother May I GET SAUCED?!! / May 14 / 1:00p -4p / Treat Mom to a fun filled afternoon of food, wine, and culinary entertainment for Mother May I GET SAUCED?! / Price: $58.50 – $65.00 / Please check our website www.danzadelsolwinery.com for additional information and reservations. 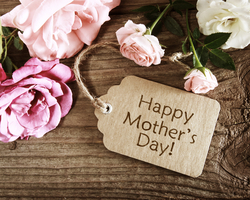 Mother’s Day Lunch / May 14 / 12pm-3pm / Gourmet three-course champagne lunch prepared by Executive Chef Dean Thomas. Live music by Jimmy Patton / Tickets $54 per person, children 10 & under $17. Tickets available via website www.europavillage.com or calling Event Department (951) 695-7175. Mother’s Day Champagne Brunch in the Pinnacle Restaurant / May 14 / 10am-3pm / For a full menu please visit www.falknerwinery.com. Live Entertainment will be provided / Cost: $69.95+/person (Wine Club $59.95+/person) Children (3-10) $29.50+/child (Wine Club $24.95+/child) / Reservations required please call 951-676-8231 option 4. Mother’s Day Brunch / May 14 / 10am – 3pm /Enjoy live entertainment, our annual Petting Zoo, and a special bottle of wine to go home with mom! / Buffet + unlimited Sparkling Wine $64.95. Buffet Only $58.95. Children $14.95 / Reservations are required, online at www.wilsoncreekwinery.com or by calling 951-699-9463. Posted in Events, Winery News | Comments Off on Mother’s Day in Temecula Wine Country! Most guests who are new to our wine country don’t realize just how unique the Temecula Valley Wine Country really is. Although, there are several aspects that make us unique, our thriving culinary scene certainly stands out at the top of the list! In fact, there are over 15 of our wineries that have restaurants or eateries on their property. Top chefs from all over Southern California are taking up roots in Temecula Valley Wine Country and several Temecula winery restaurants have received national acclaim. One such restaurant, The Restaurant at Leoness Cellars, was recently rated #1 Winery Restaurant by USA Today’s 10 Best Reader’s Choice. Also voted Best Restaurant of the IE (Inland Empire) for 2012, 2013, 2014, and 2015, The Restaurant at Leoness features a variety of appetizers, colorful salads, unique flatbreads, and seasonal Chef Selections. Additionally, The Restaurant at Ponte Winery was rated by OpenTable as one of the top 100 restaurants in the US for outdoor dining. Their al fresco dining area is surrounded by vineyards and beautifully manicured gardens. At Ponte Vineyard Inn, Bouquet Restaurant was recently awarded the TripAdvisor 2015 Certificate of Excellence! Dine indoors or out in the fine dining setting located at the luxurious AAA Four Diamond Inn, surrounded by manicured Italian gardens with stunning views of the vineyard and our 1-acre pond. Or, if you’re just looking for a quick bite, the alluring and elegant underground Cellar Lounge is located on the basement level of the Inn and features signature cocktails, craft beer, gourmet entrées and small plates. No stranger to winning awards, South Coast Winery Resort & Spa’s Vineyard Rose Restaurant has been the winner of the Wine Spectator Award of Excellence for the past five years. They serve breakfast, lunch and dinner, pairing their seasonal menu expertly with their award-winning wines. Be sure to visit one of our winery restaurants on your next visit to Temecula Valley, Southern California’s Wine Country. You’ll be glad you did! Avensole Restaurant & Marketplace – As Temecula’s newest Wine Country restaurant, Avensole offers a charming place to savor eclectic foods and delicious wines in a lively atmosphere. 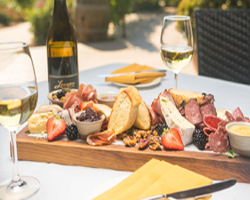 Breezeway Grill at Lumiere Winery – Enjoy beautiful vineyard and mountain views from the patio of the Breezeway Grill. Try the new peaches and ice cream dessert made with Lumiere’s Sauvignon Blanc. Carol’s Restaurant at Baily Winery – Walking into Carol’s is somewhat like walking into a medieval or European castle. The menu features a variety of beautiful entrée salads, appetizers, sandwiches, fresh fish, steak, and pasta dishes. Bel Vino Bistro -Bistro diners enjoy an upscale American menu with plates such as the seared albacore sandwich, delicious signature flatbreads, and fresh seasonal salads inspired by Chef Nathaniel Philips. Meritage at Callaway Winery – Sitting high atop Temecula’s breathtaking wine country, Meritage at Callaway offers guests incredible panoramic views of the rolling hills and vineyards. Guests can enjoy a delightful array of fresh, farm-to-table meals, made from scratch. Sangio’s Deli at Cougar Vineyard & Winery – Want a quick meal in the midst of wine tasting? Look no further than Sangio’s Deli. All Salads and Sandwiches are made to order with Boar’s Head quality products. Sliced meats and cheeses are also available. Pinnacle at Falkner Winery – The Pinnacle offers great panoramic views, outstanding Mediterranean style food, and high quality service. Critics have consistently praised the food quality, customer service, and great ambiance at Pinnacle. Baba Joon’s Kitchen at Fazeli Cellars – Baba Joon’s Kitchen provides a unique – and extensive – Mediterranean Persian fusion menu that results in a perfect wine pairing experience. Flower Hill Bistro at Miramonte Winery – The bistro offers a variety of craft food items from the Fromage + Tomato, to the amazing Roasted Veggie flatbread, to the glorious Piri Piri Half Chicken. Monte De Oro Bistro at Monte De Oro Winery – Offering casual lunch fare – seasonal salads, Panini’s, and pasta dishes along with delectable appetizers including meat & cheese plates, hummus, and seasonal snacks. Annata Bistro at Mount Palomar Winery – Annata Bistro/Bar has a full service bar, handcrafted signature cocktail menu, beer on tap, all of the Mount Palomar Wines you know and love, and a Mediterranean inspired menu. Cave Café at Oak Mountain Winery – With a focus on small plates of fresh, locally sourced ingredients, with creative flavor and presentation, head chef Eric Celaya offers a menu with the variety necessary to create snack plates, tapas, light meals, full Mediterranean-style dining, or even just an intimate dessert. Mama Rosa’s Trattoria at Robert Renzoni Vineyards – Pizzas, gourmet sandwiches and pasta rule the menu here. Guest favorites include tortellini stuffed with braised short ribs, Gorgonzola cream sauce, garlic and Prosecco, and a meatball sandwich layered with sauce, salami, chili oil and Provolone, baked and finished with basil and Parmigiano. Café Champagne at Thornton Winery – A breathtaking entrance to the Temecula Valley Wine Country, Café Champagne’s elegance combines with “Contemporary Fusion Cuisine” to create a well-rounded flair for the total gourmet experience. 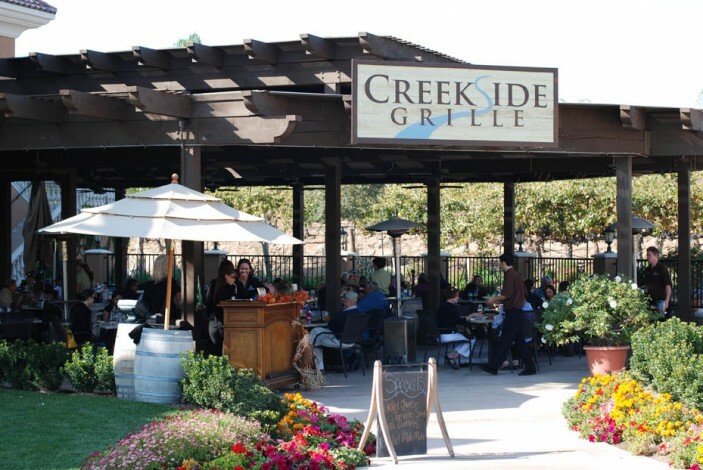 Creekside Grille at Wilson Creek Winery – Dine al fresco among the vines and enjoy casual, yet tasteful items fill the menu with delicious appetizers, gorgeous salads, scrumptious sandwiches, and of course Creekside seasonally inspired specials. Posted in Winery News | Comments Off on It’s a Foodie Paradise! Rosés: A Rise in Popularity! America has fallen in love with rosé wines, one of the fastest growing segments of the US wine market. Popularized in the South of France, rosé is now made in every major wine region around the world, including Southern California’s premier wine region, the Temecula Valley. As a matter of fact, wineries here have been making rosés for decades – Hart Winery made its first blush wine, a Rosé of Grenache, in 1980, the year the winery opened! From sensuously sweet to classically dry to splendidly sparkling, Temecula Valley wineries deliver a myriad of styles to suit every palate and occasion. Rosés are created by limiting the amount of time the skins of the grapes are left to sit with the colorless juice, often for only a few hours. This minimal skin contact creates a wide a range of shades, from pale salmon pink, to raspberry through to deeper strawberry hues. The grape variety will also influence the final tone. Thicker skinned varieties, such as Cabernet Sauvignon, Tempranillo and Cinsault, lend a slightly deeper berry red to the finished wine, while those crafted from more delicate grapes, like Grenache, may have a paler, rose-petal tinge. But don’t be fooled into thinking that lighter means leaner when it comes to aroma and taste! Paler wines may explode with just as many notes of strawberry, raspberry, watermelon, cranberry, ripe peach and deep citrus as their bolder-colored cousins. According to Nielsen, sales of rosé wines priced over $11 are up a staggering 60%, accounting for .2% of all table wine, about the same size as the entire US market for the wines of Portugal or South Africa. One reason for the popularity of rosé, besides its easy-drinking, laid-back, relaxed vibe, is its versatility. It’s easy to sip on its own, at the beach or poolside, and it can be the perfect foil for food. No matter the occasion, you’ll find a Temecula Valley rosé that will prove the perfect compliment. Sparkling rosé is always a wonderful way to start a gathering of any kind. Award-winning South Coast Winery produces four fabulous blush sparklers including their NV Blanc de Noir, a classic dry style, and the popular Ruby Cuveé with a touch of berry-filled sweetness. Not to be outdone, Thornton Winery has been creating sparkling wines for many years and features several sparkling rosés on its extensive list, as do Oak Mountain Winery, Wiens and Wilson Creek wineries. These high-quality blushing bubblies fall in the $19 to $38 price range. The region of Provence, in the south of France, is the benchmark for traditional, dry, food-friendly rosé. That tradition is alive and well in Temecula, with many of the wineries emulating this classic style, priced at an average of $22. Hart Winery has a delightful Rosé of Tempranillo, or venture next door and try Callaway Vineyard & Winery’s Rosé of Sangiovese – it’s won a bevy of awards since its initial 2008 vintage. Travel down Rancho California Road and sample Miramonte Winery’s Rosé, made from a blend of typical Mediterranean grape varieties: Grenache, Cinsault and Syrah. Oak Mountain Winery, on the DePortola Trail, produces several variations on the Rosé theme, including their multiple-award-winning 2013 River Rhodes Rosé made with 100% Syrah. Or enjoy a bottle of Vindemia Winery’s Vermeille Grenache 2013, a lovely single-varietal blush wine. If you crave something sweet or off-dry, you will find yourself spoilt for choice. Why not seek out Pink Crowded rosé at Wiens Famiy Cellars, an off-dry blend of Grenache, Zinfandel and Malbec. Or reach for White Zinfandel or White Merlot at Bel Vino, or relax in the gardens of Europa Village while sipping on a cool, refreshing glass of Garnacha Rosa? Any of these choices would be stellar matches to a wide range of foods. Dry rosé is fantastic with flavorful appetizers such as tapenade, flatbreads, charcuterie platters, hummus, and soft cheeses like chèvre and brie. When it comes to main courses, pop the cork on another bottle of rosé and enjoy it with pizza, a variety of fish or poultry dishes, salads, light meats like pork or ham, or a good, juicy burger! Off-dry styles are wonderful with firmer cheeses such as Parmesan and aged gouda. Or sample a sip with a strawberry and spinach salad! And, of course, there’s always room for dessert, with a glass of sweet style rosé! Pair anything featuring berries, peaches, nectarines or spicy ginger with Irresistable Rosato from Falkner Winery (crafted from Sangiovese and Cabernet Sauvignon) or Sara Bella White Cabernet Sauvignon from Maurice Car’rie Winery. Temecula Valley vintners are bottling their rosé wines from the fantastic 2015 vintage now, in early 2016. These wines are made to be consumed fresh, upon release. So grab your beach blanket, fire up the grill or unfurl your finest white tablecloth and get ready for a superb sampling of refreshing, scintillating rosé’s from the wineries of Temecula Valley Southern California Wine Country. Posted in Winery News | Comments Off on Rosés: A Rise in Popularity! When you think of summer, does your palette scream for red wine or does white wine consume your thoughts? Around here, we’re celebrating summer with crisp and refreshing white wines. Since the weather is hot, we tend to prefer eating lighter foods, cold dishes and main course salads; which complement white wines. From Chardonnays with flavors of green apple, citrus, pineapple and papaya to Pinot Grigios with fresh pear, melon and citrus notes, the possibilities are endless. Perhaps, try a Chenin Blanc with its floral aromas and apple and pear flavors, or for those of you who prefer wines of the sweeter persuasion, a Gewurztraminer may suit you just fine. And, let’s not forget about the ultimate in a refreshing beverage…a glass (or two) of sparkling wine! Whether lunching by the pool, or barbecuing with friends, white wines perfectly pair with many summer eats. Chardonnay and Chenin Blanc both pair well with chicken, shellfish and pasta, while Pinot Grigio would be perfect with a spicy Chinese food dish or a antipasto plate. Pair that Gewurztraminer with a light and healthy chicken salad and your sparkling, well, we just like to pair that with anything! Maurice Car’rie Vineyard & Winery ~ 2012 Chenin Blanc – This light and slightly sweet Chenin Blanc is rich in floral aromas reminiscent of honeysuckle. Ponte Family Estate Winery ~ 2014 Pinot Grigio – Medium bodied wine with the aroma of pear, melon and lemon. South Coast Winery Resort & Spa ~ 2013 Gewurztraminer -This vintage is lightly sweet, with a solid acidity and exotic floral scents of rose and lychee fruit. Wilson Creek Winery ~ Grand Cuvee Sparkling Wine – Light and refreshing, and very fun. Great in Mimosas! A fun party sparkling wine. The weather is warming up, school’s just about out and we’re dusting off our backyard grills in preparation for summer get-togethers. If your summer plans include spending some time in Temecula Valley Wine Country or if you’re local and plan on entertaining out-of-town guests, be sure to check out some of the great events being hosted by our wineries. Every Sunday / 11:30a-2:30p / Bring your well-mannered pooch to lunch! Live acoustic entertainment. Thursday-Sunday / 11:00a-2:30p / Tours and vertical tasting of library wines. Sit down with bread and cheese plate; $30 (Reservations required 24 hours in advance) / Bar Tasting; $20. Call for reservations: 951-972-9768. Sunday, June 21 / 11:00a / Menu specials for Dad! June 11-27 / Visit www.shakespeareinthevines.org for pricing information and reservations or call 951-402-7488. Grab your friends and join us for a marvelous time! Friday and Sunday from 3:00p-6:00p in the lounge at Meritage at Callaway. 20% all tapas, $2 off wine by the glass, 20% off bottles of Callaway wines and available domestic, import and craft beers. Every Sunday at Meritage at Callaway from 4pm-8pm in the main dining room. Enjoy sipping on our very own Watermelon Sangria while soaking in the sunset vineyard views. Live music from local musicians begins at 6pm. No cover charge and no reservations required. Sunday, June 21 / Take care of Dad by taking him out for what he wants, you know he deserves it! Mad Mike’s Gourmet Sausage with a choice of toppings served with a side of coleslaw and paired with a glass of our wine or a glass of Black Market Beer for $14 per person. For our wine club members, enjoy yours for $12 per person. Every Friday evening / 5:00p-8:00p / Come enjoy live music at Cougar Winery. The deli is also open later until 7:00p. For musician schedule, visit www.cougarvineyards.com. Thursday, June 25 / 6:30p-9:00p / $85 per person / $75.60 per person, wine club / Buy tickets in the tasting room or online at www.europavillage.com. Sunday, June 21 / 11:00a-3:00p / Enjoy the breathtaking views of our estate vineyard, while you enjoy lunch and a glass of wine on our winery hilltop patio overlooking the vineyard. Menu includes Bourbon Brown Sugar Smoked Brisket, Caribbean Jerk BBQ Chicken, Black Beans & Rice, Garden Salad and Fresh Baked Dinner Roll/ $29 per person, plus tax. Reservations are required by June 17th by calling 951-699-8845. Every Saturday night through October / 6:00p-10:00p / No admission price / Live music, mechanical bull rides, along with wine. Supervised children with their families are welcome to attend. June 5, 6,7 – all day / Join us for a special art show of summer-inspired art by some of the nation’s top artists. Entry is free. Thursday, June 25 / 6:00p / Join us for a night of music and fun with Dueling Pianos! $10 gets you in with a glass of sangria. Tickets available online at www.lorimarwinery.com. Monday, June 29 / 6:00p; movie starts at sunset / “Pairings” mobile kitchen will be available! No outside food allowed. June 11 and June 28 / 12:00-3:00p (June 28 class is 1:00p-4:00p)/ $45 per person – includes a glass of wine! (Discount given for multiple guests) / To sign up or for more information, please contact Dorothy Hawthorne at 951-302-3088 or bottlesnbrushestemecula@gmail.com. Sunday, June 14 / 1:00p-4:00p / Includes all art supplies, hors d’oeuvres and a glass of wine. Reservations are required by calling 951-699-9102 or by email to events@oakmountainwinery.com. Saturday, June 27 / 6:00p-9:00p / $65 per person; $60 per person, Wine Club / Sample three different red wine varietals and learn what differentiates them from one another. Then, blend and taste as you craft your very own wine! Includes a family-style dinner with a glass of wine. Reservations are required by calling 951-699-9102 or by email to events@oakmountainwinery.com. Bubbles 101 – We want to burst your bubble with our champagne class. Blending Reds – Create, bottle and label your very own blend. Wine Tasting for Dummies 101 – Our beginners class for Wine Tasters. This is a good class to take if this is your first visit to a winery and want to know the basics of wine tasting. Rhone Wine Class 201 – Our second, more advanced class after taking Wine Tasting 101 is our Rhone Wine Tasting Class 201. Bordeaux Wine Class 201 – You will learn how these grapes are grown and how they are harvested and processed, while tasting Oak Mountain wines from different areas in the Bordeaux region of France. Sunday, June 7 / 6p-10p / South Coast Winery Resort & Spa and K-FROG are proud to announce country artist Frankie Ballard will be performing live and in person on Sunday, June 7th for another sold-out Rhythm on the Vine Concert. Doors open at 6pm. Get your tickets today. JUST ANNOUNCED: LOCASH added to line up. They’ve played at the Grand Ole Opry, rocked it at NYC’s Times Square, and now LOCASH will be opening the Frankie Ballard Concert on June 7th at South Coast Winery Resort & Spa. Tickets start at just $50, so visit www.wineresort.com for concert details and to reserve your seat, or call 800-539-1375 today. For those who truly love to dine, South Coast Winery Resort & Spa’s culinary team offers a front row seat into their world with a special “Chef’s Table Dinner”. Whether it’s a special celebration or an intimate affair, our Chef’s Table dinner for 2 to 8 guests will define the art of fine cuisine with a memorable evening of food and wine for only $135 per person. Call 951-491-8077 to reserve your table today. Monday-Friday 3:00p-5:30p / Join us in the Vineyard Rose Lounge for reduced priced selected appetizers, award winning select glasses of South Coast wines and local drafts. 6:00p-9:00p / Wednesday nights just got even better at the Vineyard Rose Restaurant as award winning pianist, Blessie Isaac-Hopkins, takes the helm behind our elegant grand piano. Monday-Thursday 11:30a -3:00p / Specially priced $9.99 lunches at the Vineyard Rose Restaurant for those aged 55 and over. Call 951-587-9463 x 2 for more information or reservations. Tours are held daily at 11 AM, 1 PM and 3PM, Monday through Sunday. Due to the limited sizes of each tour, advance reservations are required with prepayment, and are non-refundable. Must be over 21 years of age to attend. Call 800-539-1375 Ext. 350 to reserve your spot today. Sunday, June 21 / 6:00p / $85 per person / $68 per person, wine club / Celebrate Father’s day in style with a vertical tasting of four past Syrahs along with perfectly paired bacon dishes. Just in time for Cinco de Mayo! Citrus marinated steak and rich, smoky tomatillo sauce turn these tacos into something special. Pair with your favorite Temecula Valley Cabernet Sauvignon or Zinfandel. Preheat oven to 350 F. Place the flank steak in a resealable plastic bag and set aside.In a small bowl combine the marinade ingredients and whisk together. Pour the marinade into the bag with the steak, seal and shake together until the steak is well coated. Place the steak onto a shallow dish and then place in the refrigerator for about one and up to 6 hours. While the steak marinates make the tomatillo sauce. Pour the tomatillos onto a baking sheet and top with the minced garlic, a drizzle of olive oil, salt and pepper. Roast the tomatillos for 20 minutes or until soft. Pour the cooled tomatillos into a food processor with the remaining sauce ingredients and puree until smooth. Season with salt and pepper and set aside until ready to use. Remove the flank steak from the marinade and pat dry. Season with salt and pepper. Grill the flank steak on each side for about 5 to 6 minutes. Transfer the steak to a cutting board and allow it to rest for about 5 minutes Slice the steak against the grain into thin strips. To assemble the tacos place desired amount of steak onto a grilled tortilla and top with the tomatillo sauce. Serve warm with a wedge of lime. Callaway Winery ~ 2012 Zinfandel – This classic Zin begins with full aromas of rich, ripe strawberry, black cherry, dusty white pepper and anise, leading to the palate brimming with dried cranberry and jammy red and black fruits. Leoness Cellars ~ 2012 Zinfandel – Rich and full-bodied, this wine offers aromas and flavors of sweet boysenberry and blackberry framed by soft tannins and a long, silky finish. Thornton Winery ~ 2009 Cabernet Sauvignon – Very classic berry and pepper aromas came forth while subtle herbaeceous notes meld with the warm toasty aromas from the oak. Wilson Creek Winery ~ 2011 Family Reserve Cabernet Sauvignon – This Cabernet displays deep rich ruby color. Aromas of spice reminiscent of clove with hints of leather layered with a fruitiness of blueberry and raspberry play on the nose. This wine’s structured tannins are well incorporated into a long pronounced finish. Courtesy of Wilson Creek Winery, here’s a new recipe from The Creekside Grill’s Executive Chef Steve Stawinski. This light fish dish pairs well with Wilson Creek Winery’s 2012 Roussanne. Peel the papaya and cut in half lengthwise. Scrape out the seeds with a spoon. Dice the papaya into 1/2” cubes and put into a bowl. Cut the tomato in half lengthwise and squeeze out the seeds. Cut into 1/4” cubes and add to the bowl. Peel and dice the red onion and add to the bowl. Chop the jalapeno and add to the bowl along with the cilantro. Add the lime juice and stir to combine. Let sit for at least 20 minutes to marry the flavors together. Whisk eggs in medium bowl to scramble. Season the halibut with salt and pepper. Dredge in flour, shake off extra. Place in the egg and coat thoroughly then coat with pecans. Heat the oil in a heavy bottomed skillet. Cook halibut in the pan over medium heat until golden. Turn the halibut over and continue to cook until second side is golden and fish is cooked through. Remove from the pan and rest on a clean kitchen or paper towel for 3 minutes. Serve topped with the Papaya salsa. Enjoy! Creekside Grille has a gluten-free menu! Not only does the restaurant staff work hard to give you excellent food and epic service, they genuinely care about your well-being. Celiac disease is an auto-immune disorder triggered by consuming the gluten protein. (According to the National Foundation for Celieac Awareness, NFCA). People who are sensitive to gluten (found in wheat, barley & rye) or who have been diagnosed with Celiac disease have the opportunity to enjoy a delectable lunch with friends and family while wine tasting at Wilson Creek. All of their wines are gluten-free too — cheers! Super tasty gluten-free dishes include Roasted Shelton Chicken, Summer Succotash with Rosemary Roasting Jus. Join us for Westfield UTC’s first annual event – Uncorked – taking place on Saturday, June 29th. Temecula Valley is the official sponsor of the wine walk. Taste dozens of popular wines from 12 different Temecula Valley wineries paired with tasty bites from Westfield UTC’s finest restaurants: Seasons 52, Eureka Gourmet Burger & Craft Beer, Tender Greens and Fixtures Living’s own, Sam the Cooking Guy. The wine tasting stations will be operating from 4-7pm and concluding with a live sunset concert in Palm Plaza at 7pm featuring Michelle Branch and the music of Brandon & Leah. Tickets are only $10 advance/$15 at the door. All proceeds go to the San Diego Botanic Garden.